Sunday Rudy and I are heading to LA for vacation. During this trip we decided we want to take one day from our usual Disney fun to go to Universal Studios and check out the new Wizarding World of Harry Potter, which I am very excited about. We are both huge Harry Potter fans and always wanted to go to Florida to check out their Harry Potter world. Unfortunately Florida is pretty far and we never did go through with hopeful plans of visiting. They finally opened one this month in Hollywood and it's much more closer to us. I plan on taking tons of photos of the day/trip and I will be sharing them here but for now I wanted to share the outfit I have chosen for that day. 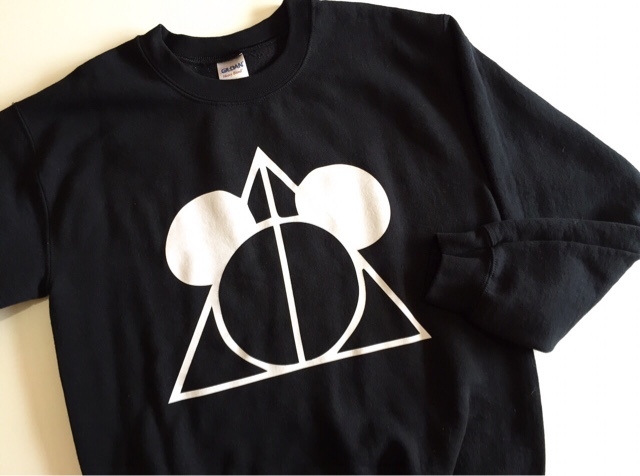 My good friend Imelda was so sweet and surprised me with this crewneck of Mickey Mouse and the Deathly Hallows sign during one of our weekly hang out dates. I remember seeing her wearing a tee shirt version of this a couple years back and was obsessed with it. It was super sweet of her to gift me this since she knew I would be visiting the park some time soon. She made this herself too! 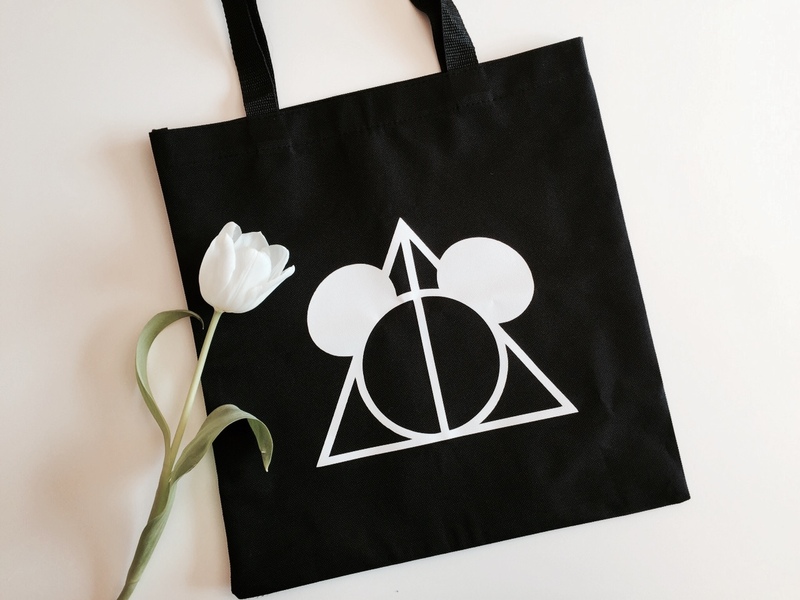 It's perfect since I love Disney and Harry Potter. LA tends to be very warm during the day and then really cold at night so I plan on wearing this in the evening when it cools down. Imelda also gifted me a matching tote and a tee shirt of this print for Rudy which he loved it! She also made me a shirt similar to one that I had been wanting to purchase. This is super cute its a Luna Lovegood shirt and says, "I suspect the Nargles are behind it" with her cool little sunglasses on the bottom. She even made her glasses a glitter color so it could match Luna's and it came out so cute! I'm so excited to wear this. I feel its going to be something I won't see anyone wearing which is always a plus. I even purchased the sunglasses to wear at Hogwarts ha ha. If you are reading this Imelda thanks a bunch once again for all the goodies, you are the best! Awwww! I loved this post so sweet. Hope your having fun on your trip! Can't wait to see the pictures when you come back. I can't wait to see all your photos from your trip. I really liked everything in this post. Thank you, I should be posting that sometime next week.